RevStream Marketing’s Managing Director, Patrick O’Donnell, is a #1 Best Selling Author and featured speaker on inspiration, growth, leadership and marketing. Click the topics below for more details on the talks along with testimonials from those in attendance. Please note: All programs are customized and can be delivered as a keynote, breakout session or seminar. Previous topics that can be customized for groups. Contact us for more details. Ready to revolutionize your business? It’s time to reach more, earn more and make a greater impact on the world! Do you have all the business you need? Are you and your business doing everything you possibly can to generate as many leads as possible, follow-up with those leads most effectively and convert those leads into sales (and do so while you sleep)? If not, now you can. 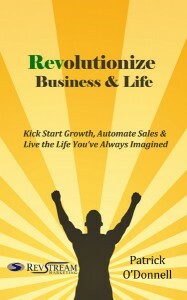 Learn how in The 7 Steps to Revolutionize Your Business. During the presentation, we’ll share the 7 ways your company is losing sales. In every case when we’ve met with companies, we’ve found they are not doing some or all of the 7 items and are thus losing sales. Then, when you do these 7 steps, you can revolutionize your business. Are you getting everything you want from your career? Or, have you been reactionary and let outside factors dictate your level of career success? If you’ve felt stuck, bored or in a holding pattern recently or your entire professional life, it’s time for a breakthrough! It’s time for you to take charge of your career. Learn the 7 steps to kick start growth in your career! This presentation shows the 5 critical (but most overlooked) elements of marketing a business successfully. It is 35 minutes, jam-packed with details on the five elements. You’ll see real case studies (how businesses earned $90,000 in a weekend, $1 million in 10 minutes and $10 million from two trade shows) are indeed true and you’ll see exactly how these companies did it. You’ll hear from two people just like you who implemented these steps have reaped the rewards. This presentation is available as a webinar here. Patrick O’Donnell will share how he went from the concept for a book to hitting #1 on the best sellers list in 10 days. This included writing, publishing, promoting and hitting the best sellers list. He’ll show you how he did it, how you can too, and more importantly, how it can be an ongoing lead generation source for you and your business. For booking Patrick as a speaker for your event, please contact us at (404) 828-0520 or complete the contact form here.